The man overseeing Fifa's presidential polls should step aside due to conflict of interest, says the Liberian FA. Domenico Scala, who heads up Fifa's Ad-Hoc Electoral Committee, is Swiss-Italian - as is Gianni Infantino, one of the five presidential candidates. Scala excused himself from the 2015 elections as he shared nationality with a candidate, Swiss Sepp Blatter. LFA boss Musa Bility says he will go to the Court of Arbitration for Sport if Scala does not withdraw by Thursday. The battle to replace long-standing president Blatter takes place in 18 days' time. "Article 7.4 of the Electoral Regulations is clear that any member of the Ad-Hoc Electoral Committee who has a conflict of interest … is thereby barred from sitting as a member of the Committee and must be replaced," Bility wrote in a letter to Scala on Monday. Ahead of elections in May 2015 between Blatter and Prince Ali of Jordan - both Scala and Claudio Sulser, who was also on the Ad-Hoc Electoral Committee, stepped aside for this reason. 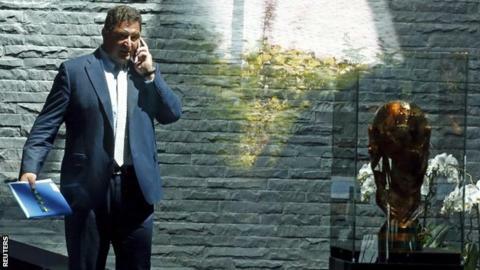 "Prior to the final review process, Domenico Scala (as a dual Swiss/Italian national) and Claudio Sulser (as a Swiss national) withdrew from their positions to avoid any appearance of a potential conflict of interest based on nationality," Fifa wrote at the time. However Andreas Bantel, a spokesman for Scala, says "the fact that a member of the ad-hoc electoral committee has the same nationality as a candidate does not result in a conflict of interest. "There is no such provision whatsoever in the relevant regulations of Fifa," he told BBC Sport. "For the last election period Mr Scala withdrew because the Swiss candidate was the incumbent President. Scala did so in order to avoid even any appearance of a potential conflicted of interest situation and simply as a precautionary measure on a voluntary base. "For this election there are five candidates with no incumbent President. Hence, there is no potential conflict of interest at all." It remains to be seen whether Bility will go ahead with his threat to take the case to the Court of Arbitration for Sport. In his letter to Scala, he wants to know why the same process has not been followed ahead of the 26 February election. "Following an unprecedented period of sustained turmoil and damage for Fifa as an institution, the fairness and integrity of the current electoral process are absolutely vital for Fifa," Bility wrote. "If we do not receive confirmation from the Fifa Ah-Hoc Electoral Committee within three working days of receipt of this latter that you are stepping down … with immediate effect, the Liberian FA reserves its right to challenge that decision by all available routes." Bility had hoped to participate in the elections himself before being denied by the Electoral Committee in November after failing an eligibility check. On Saturday, the Liberian pledged his vote to Prince Ali while urging his fellow Africans to do the same. Alongside Prince Ali and Infantino, Frenchman Jerome Champagne, Bahrain's Sheikh Salman and South Africa's Tokyo Sexwale are also bidding to replace Blatter as president. The election, which is voted on by Fifa's 209 members, will take place in the organisation's headquarters in the Swiss city Zurich.